The RCN has urged parents of children with asthma to take steps to prevent a spike in emergency hospital admissions as pupils return to school after the summer holidays. The college said that on average there are three pupils with asthma in every classroom in the UK. It said children going back to school after the summer holidays are at a higher risk of potentially deadly asthma attacks. Asthma-related hospital admissions treble among school-aged children in September every year, the college added. The most recent set of data the RCN has shows that between August and September 2015, emergency asthma admissions in England, Scotland and Wales for children aged 0-14 tripled, increasing from 1,089 to 3,203. 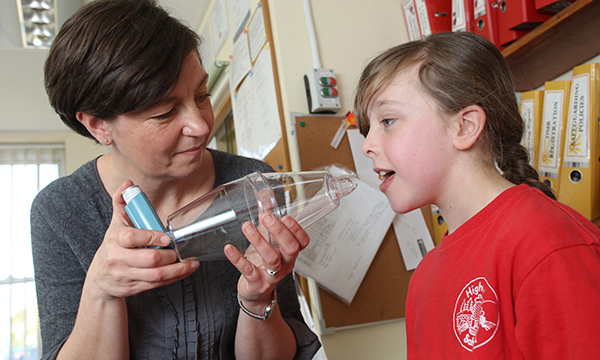 The college, which is preparing to hold its annual school nursing conference tomorrow in London, said there are various reasons behind the rise, but it may be due, in part, to children with asthma not regularly using their preventer inhaler during the summer holidays. Other factors can include a lapse in routine, changes in the weather and exposure to coughs and colds when they return to school, school nurses at the conference will warn. Parents should ensure the children are taking preventer medication and book their annual asthma review with their GP or asthma nurse before term starts. Meanwhile children's backpacks should contain their reliever inhaler, spacer and care plan. The charity's head of services Sonia Munde said: 'Going back to school should be an exciting time for children, but many end up in hospital fighting for life after an asthma attack.